HELENA, Mont., — With over 15,000 miles of trails ready to be explored, it’s no wonder Montana is a hiker’s paradise. No matter the season, Montana is the perfect place to hike and discover all the unspoiled beauty this state has to offer, but the most underrated season to experience breathtaking beauty is autumn. Crisp mornings, red and gold hues around every bend, and trails that are less traveled make autumn the ideal time to hike in Montana. With vibrant orange and yellow foliage against green pine trees, fall is the perfect season to explore Sluice Boxes State Park, located just outside of Great Falls. The trail follows the Belt Creek flow through the soaring cliffs of Belt Creek Canyon, and crossing the creek is part of the route you’ll follow. This hike showcases the stunning contrast of autumn colors from Chokecherry, Aspen and Cottonwood leaves against the light rock of the cliffs. The park is also a great opportunity to spot wildlife, so stay on the lookout for elk, moose, black bears, and white-tailed deer. Imagine standing in the towering presence of ancient Western Red Cedars – some of which are 12 feet in diameter and 175 feet tall. The Ross Creek Cedar Grove Scenic Area offers a self-guided interpretive nature trail through a unique forest ecosystem. In autumn, the grove and creek are alive with native wildlife, birds and fish and have fewer crowds. While the hike is short, you’ll find it hard to leave the area and its peaceful, cathedral atmosphere; where many of the immense 1,000 year-old cedar trees make you feel like you’re in the presence of giants. 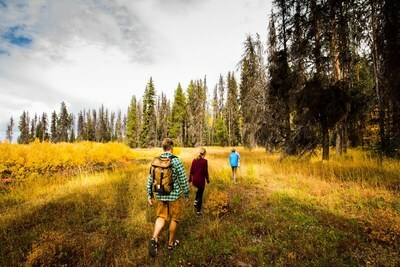 The scenic area is located in the Kootenai National Forest just outside of Libby, where you can find more accessible hiking opportunities in this far northwest corner of Montana. Montana’s first and best-known state park, Lewis and Clark Caverns State Park west of Bozeman, offers visitors incredible views above and below ground. While the expansive limestone caverns are a favorite, you won’t want to miss the above-ground opportunities to explore 10 miles of trails. With something for everyone, avid hikers will enjoy climbing elevation on the two main trails, and leisure hikers will love the short Nature Loop Trail. Take a camera to photograph the fall foliage and wildlife you’ll see along the way; as well as a few extra layers to wear in the crisp fall air. For hiking with a river view, pack a lunch and follow the trail from the campground to the historic Jefferson River. The river offers fishing with incredible views of limestone bluffs dotted with green pine and gold aspen forests as a backdrop. Known for its rugged mountains and sub-alpine tundra plateaus, Custer Gallatin National Forest Beartooth District, close to Red Lodge, is home to stunning scenery, fantastic trails and epic views of fall foliage. For a truly memorable hike, plan a day on the Stillwater River Trail #24. Begin the hike in the shelter of the Stillwater River Canyon as you follow the Stillwater River. The hike will open up as you leave the canyon and ascend through fragrant pine and aspen trees. The highest elevation point is a little more than two miles from the trailhead and provides a breathtaking view of Sioux Charley Lake below. Hiking on Wild Horse Island State Park in the fall is the perfect opportunity to enjoy jaw-dropping scenery and abundant wildlife viewing. At over 2,100 acres, Wild Horse Island is located on the largest freshwater lake west of the Mississippi. This island park is surrounded by the crystal clear waters of Flathead Lake and can only be accessed by water. You’ll want to plan for a day trip to truly enjoy the views from the island, and stay on the lookout for bighorn sheep, mule deer and a few wild horses that call the surrounding Ponderosa pine forests and rolling hills home. As the busy summer season for Yellowstone National Park winds down, the fall season is a great time to visit the park. The Elephant Back Mountain Trail takes you on a loop through the dense Lodgepole pine forests to a stunning overlook. You’ll want to bring a camera to capture the panoramic views of Yellowstone Lake; the beautiful yellow and red hues of surrounding deciduous trees create an incredible contrast against the dark green conifers. Listen for the bugle of an elk as they are active as this time is their rut season, and you’ll want to look above for migrating raptors like bald eagles. Follow these trails and more to unlimited adventure and discover your #MontanaMoment with a fall getaway. Hikingand wildlife viewing are plentiful this time of year at one of Montana’s national parks, state parks or other public lands. When you’re ready, travel resources are available to help bring your perfect autumn trip to life.